One of the most potent of known toxins acts by joining the two strands of the DNA double helix together in a unique fashion which foils the standard repair mechanisms cells use to protect their DNA. A team of Vanderbilt University researchers has worked out the molecular details that explain how this bacterial toxin -- yatakemycin (YTM) -- prevents DNA replication. The team’s results, described in a paper published online on July 24, 2017 in Nature Chemical Biology, explain YTM's extraordinary toxicity and could be used to fine-tune the compound's impressive antimicrobial and antifungal properties. The article is titled “Toxicity and Repair of DNA Adducts Produced by the Natural Product Yatakemycin.” YTM is produced by some members of the Streptomyces family of soil bacteria to kill competing strains of bacteria. It belongs to a class of bacterial compounds that are currently being tested for cancer chemotherapy because their toxicity is extremely effective against tumor cells. "In the past, we have thought about DNA repair in terms of protecting DNA against different kinds of chemical insults," said Professor of Biological Sciences Brandt Eichman. "Now, toxins like YTM are forcing us to consider their role as part of the ongoing chemical warfare that exists among bacteria, which can have important side effects on human health." Cells have developed several basic types of DNA repair, including base excision repair (BER) and nucleotide excision repair (NER). BER generally fixes small lesions and NER removes large, bulky lesions. A number of DNA toxins create bulky lesions that destabilize the double helix. However, some of the most toxic lesions bond to both strands of DNA, thereby preventing the cell's elaborate replication machinery from separating the DNA strands so they can be copied. In collaboration with scientists from the UK, Europe, Japan, and the United States, researchers at the Human Genome Sequencing Center at Baylor College of Medicine in Houston, Texas have discovered a whole genome duplication during the evolution of spiders and scorpions. The study was published online on July 31, 2017 in BMC Biology. The open-access article is titled “The House Spider Genome Reveals an Ancient Whole-Genome Duplication During Arachnid Evolution.” Researchers have long been studying spiders and scorpions for both applied reasons, such as studying venom components for pharmaceuticals and silks for materials science, and for basic questions such as the reasons for the evolution and to understand the development and ecological success of this diverse group of carnivorous organisms. 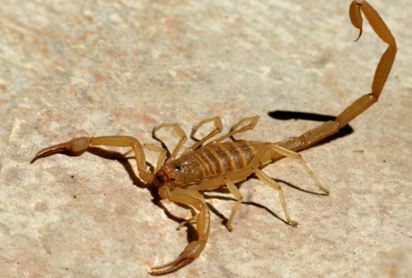 As part of a pilot project for the i5K, a project to study the genomes of 5,000 arthropod species, the Human Genome Sequencing Center analyzed the genome of the house spider Parasteatoda tepidariorum - a model species studied in laboratories - and the Arizona bark scorpion Centruroides sculpturatus, - the most venomous scorpion in North America. Analysis of these genomes revealed that spiders and scorpions evolved from a shared ancestor more than 400 million years ago, which made new copies of all of the genes in its genome, a process called whole genome duplication. Such an event is one of the largest evolutionary changes that can happen to a genome and is relatively rare during animal evolution. Dr. Stephen Richards, Associate Professor in the Human Genome Sequencing Center, who led the genome sequencing at Baylor, said, "It is tremendously exciting to see rapid progress in our molecular understanding of a species that we coexist with on planet earth.